Civilian drones are very popular. According to a projection by German air traffic control, 1 million unmanned aircraft were expected to be sold in Germany by the end of 2018. Today, drones are affordable for everyone and seem to be child’s play to operate. And even more commercial applications in the civilian sector are being developed, from the monitoring of power plants and the maintenance of technical facilities to the delivery of goods and aid to areas that are difficult to access. We are just beginning to become aware of the full range of possible applications for drones. But what is clear so far: all these new unmanned aerial vehicles must be integrated into the existing airspace. And safety must be the top priority. However, the potential of these new technologies can only be exploited if the safe operation of drones of all types and sizes can be ensured and their areas of application are accepted and supported by the population. The rules for this must be laid down now. The success of the new technology depends to a large extent on its acceptance by the population. The full potential of the options can only be exploited if the usefulness and benefits of drone applications are recognized. In a survey conducted in October 2017, the opinion research institute YouGov, commissioned by the Unmanned Aviation Association – a joint initiative of the BDL and the BDLI (German Aerospace Industries Association) – therefore analyzed the opportunities and risks that people in Germany associate with drones. The results of the survey show: people in Germany see a variety of possible uses for drones in the civilian sector. At the same time, however, many citizens expect negative implications for their privacy and security. They want clear rules for the use of unmanned aerial vehicles. Drones do not just represent opportunities. The increasing number of remote-controlled flying objects is becoming a safety challenge for air traffic. The reason for this usually is their improper or irregular operation, because not all drone operators are aware of the relevant rules. Which regulations apply depends on the type of use and the size and weight of the drone. In March 2017, the German government passed the so-called drone regulation, and since October 2017, this national set of rules for the operation of unmanned aerial vehicles has been fully applicable. Henceforth, no permit will be required for the operation of unmanned aerial vehicles weighing less than 5 kg. In addition, the existing general ban on operating unmanned aerial vehicles outside the visual range will be lifted. State aeronautical authorities may permit this type of operation in future for devices weighing 5 kg or more. An operating ban applies, for example, to residential properties for devices weighing 0.25 kg or more, or if the drone can transmit or record optical, acoustic or radio signals, as well as at altitudes above 100 meters. However, the limited flying altitude does not apply to model aircraft fields or if the helmsman has proof of knowledge – unless the device is a multicopter. In addition, operation in and over sensitive areas is prohibited, for example at police and rescue sites, over crowds and in approach and departure areas of airports. However, the competent authority may grant derogations from the prohibitions. For drones weighing 5 kg or more and for night operation, there is a basic obligation to obtain a permit. Permission is granted by the aeronautical authorities of the federal states. In addition, users must comply with the mandatory identification of drones from 0.25 kg, for example by means of fireproof stickers with the name and address of the owner. If the weight exceeds 2 kg, proof of knowledge is also required in the form of a valid pilot’s license or a test certificate issued by a body recognized by the German Federal Aviation Office (Luftfahrt-Bundesamt). The minimum age for drone operators is 16 years. Alternatively, a corresponding certificate might also be obtained from the age of 14 after instruction by an aerial sports club, but this only applies to aircraft models. All certificates are valid for a period of five years. The German drone regulation was a first important step. But the safety standards in unmanned aviation must be raised further. The current approaches at national, European and international levels to create standards for manufacturing and certification as well as comprehensive legislation for the integration of unmanned aircraft systems (UAS) into airspace are therefore welcome. The German aviation industry has formulated its own proposals for regulatory framework conditions and standards which will increase legal certainty for manufacturers and operators and thus enable the comprehensive commercial operation of drones in the future. As a key industrial technology, drones should be given due consideration in the Federal Aviation Research Program, in a targeted industry policy and when supporting export activities. Clear and far-sighted legal framework conditions must be created, primarily at the European level. Germany must play an active role in the discussion, help to shape it and thus preserve national competencies. The procedures for applying for and granting ascent permissions must be simplified and harmonized – at the national level and, in the medium term, at the European level. Registration must be mandatory for all drones with a takeoff weight of 250 g or more. Drones must be certified according to defined standards along the entire product life cycle. “Instruction leaflets” must be available with basic information on regulations and risks for all buyers. Test fields must be identified to test unmanned aerial vehicles and thus demonstrate their safe operation. Recognizability in the airspace must be ensured. Qualification of drone pilots – basic aviation knowledge must be imparted and tested regularly by authorized personnel. Protective measures must be in place for safe defense from drones, including the establishment of the reporting rules and clearly defined sanctions. In the future, drone operations at airports must be regulated by standard scenarios at the European level. The aim is to establish appropriate rules to ensure that the use of drones does not endanger commercial air traffic. This is the only way to exploit the huge potential in the civilian use of drones. It is important for air traffic that as far as possible uniform regulations are created at the international level. To speak with a strong voice on this important topic, manufacturers and operators of German aviation – represented by the German Aerospace Industries Association (BDLI) and the German Aviation Association (BDL) – have joined forces in the Unmanned Aviation Association (VUL). The Unmanned Aviation Association is committed to the sustainable and, above all, safe development of the market for unmanned aerial systems. An important task of the association is not only to exploit the opportunities offered by the widespread use of unmanned aerial systems but also to overcome the associated challenges. 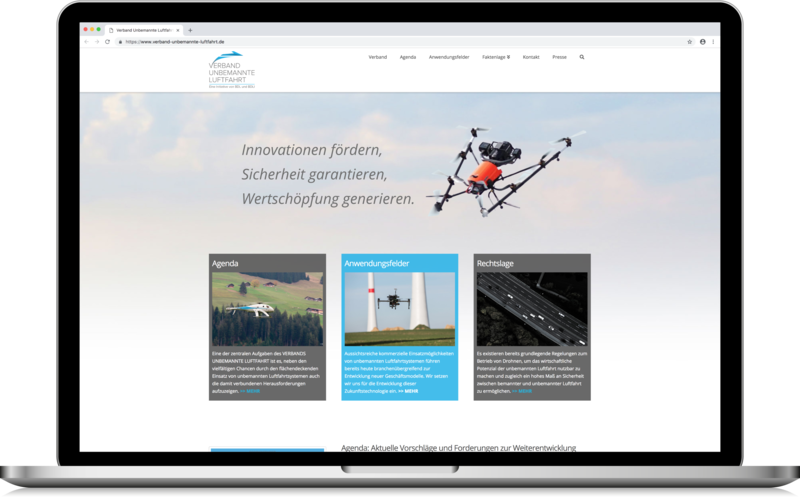 The agenda of the association and information on the legal situation and fields of application for drones can be found on the association’s website at www.verband-unbemannte-luftfahrt.de.